One of Arizona’s most sought after communities, the planned neighborhood of Desert Ridge provides residents with a great combination of Sonoran desert living, and urban amenities such as dining, entertainment and shopping. Home to over 5,700 properties, the subdivisions of Desert Ridge offer an endless variety of living options with a mix of condos, townhomes and single-family houses. The convenient location of this community is also an attractive selling point, making it the perfect choice for a variety of lifestyles. Situated in North Phoenix, this community is also the home to the world-renowned Desert Ridge Marketplace, which houses over 110 retailers, as well as other popular shopping and tourist destinations, resorts and spas. These attractions benefit the local economy and ensure thriving schools and high quality infrastructure. 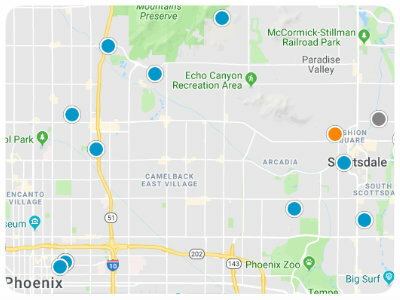 The smart location of this community also provides easy access to employment opportunities all over Phoenix, making the morning commute much easier. With niche neighborhoods for every lifestyle, Desert Ridge real estate offers a high quality of life to all of its residents, ranging from young families to retirees. The local Paradise Valley Unified School District provides a top-notch education to students, and the year-round sunshine and community hiking trails, provide outdoor enthusiasts with easy access to the rich Sonoran Desert landscape. For more information about the many real estate options available in Desert Ridge, Arizona, please contact us today!